When Samsung came up with bigger screen phone, Apple immediately defended their stance on smaller screen. In fact, Steve Jobs, then CEO of Apple said on Apple developers’ conference that they never produce any headphone which the customers unable to reach any corner of the device by customers thumb when they use it in one hand. Not more than 4 years, today Apple has introduced 5.5 inch iPhone 6. Apple also came up with iWatch as an extension to Apple family. Again, Samsung introduced its first Samsung watch 2 years back, and Nike, Navman introduced similar sort of "Health conscious" product years back. It's worth noting that Apple is years behind Samsung in offering larger screen sizes, something that may explain the company's lagging sales numbers, compared with Android devices, many of which have larger screens. So why does Apple seem to be so far behind the curve? 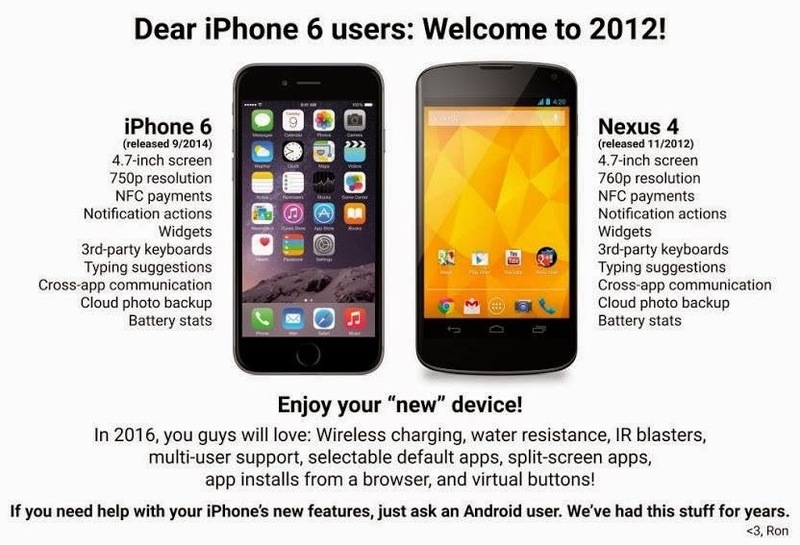 Part of the answer, of course, is that Apple only really launches one phone a year most years. Last year, it was the iPhone 5S, which was physically little different from the previous iPhone 5. It's hard to keep up with the light-speed changes in the phone industry when it takes a company a year to make a substantive change. Apple's arch-rival Samsung, on the other hand, seems to have an inexhaustible supply of new phone types and launches them to fill any conceivable, and some inconceivable product niches. But it could also be due to Apple's established culture of doing only what the company believes it needs to do, regardless of what customers may indicate what they want. The concept of limiting customer input into the design of Apple products was part of the legacy of Steve Jobs, who fostered the idea that Apple knew best.